This is "My Mom's Pencillin." She always calls it by its Japanese name miso-shiru. As a child, I had this whenever I was sick. So much so that for awhile, I didn't like tofu because I associated with being sick. Mom said it has everything that's good for you and no fat or oil so it's easy to digest. Boil about 8 cups of water. Add about 1/4 cup miso and a few teaspoons of dashi. Mix well. Cut up a block tofu, drain it a bit, dump it in and you're done. Add chopped green onions into individual bowls. This is so that if there is leftover soup, the green onions would turn an ugly color as a leftover. 1) Tofu and green onions always go in last. They are fully cooked, and you don't want the tofu to swirl around too much. 2) If you are adding somen, do this before you add eggs. You may also need to add a bit more water. 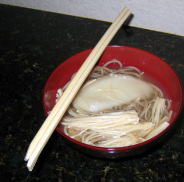 Somen has a little bit of a salty flavor, so you will not need to add any more seasoning. 2) There are two options for adding an egg. The first is to beat an egg in a separate bowl and then swirl it into the hot miso soup. This will make miso egg flower soup. Again, do this after you've added somen. Otherwise the the raw scrambled eggs will cling to the still-cooking somen. It's icky. 3) If you prefer to drop an egg in, do this AFTER you add somen. Bring the soup to a gentle but full boil and carefully crack the egg into the soup. DO NOT STIR. Let it sit for about 2-3 minutes so it holds together, longer if you want a completely hard boiled yolk.